Integrated Resources Group (ASX: IRG) has secured necessary environmental and exploration approvals for exploration on its Kalengwa copper projects in Zambia. IRG has approval for exploration on three of the Kalengwa permits, including the flagship Kalengwa South permit, along with two of the three permits of the Kalengwa East project. Due to time constraints, the Zambian Environment Management Agency (ZEMA) was not able to consider one of the Kalengwa East permits. Environmental approval for this permit is expected to be received following the next meeting of the ZEMA board at the end of September. This delay will not impact on IRG’s planned exploration program at Kalengwa East. “This is a critical milestone in IRG’s plans to become a major copper focused explorer in Zambia. The granting of the EPB’s allows IRG unrestricted exploration rights for the life of the permits”. Re-logging of historical drill cores and a desktop study of all historical exploration work at Kalengwa South has identified four areas which will be the focus of IRG’s exploration efforts. Exploration will focus on refining drill targets and will comprise a geophysical survey, soil sampling and mapping over key areas. Desk top studies and analysis of historical results over the past three months has dramatically increased IRG’s understanding of the Kalengwa South project and the significance and context of these historical results. It is clear that the initial exploration focus needs to be on locating the source of the historical soil and shallow drilling anomalies in order to firm up drill targets. Notably, it has become clear that the anomalies tested by previous drilling were derived from transported soils which may be some lateral distance from the source structures. While results were strong, with a best intercept of 3.2m at 7.3% copper and 6 g/t gold, it appears that the primary targets have not yet been tested. Soil sampling will be carried out at 1,000m by 500m line spacing and will target all four prospect areas at Kalengwa South. In conjunction with the soils program and concurrent geological mapping, the company plans to contract airborne magnetics and radiometrics over the entire Kalengwa South permit area. These programs are planned to commence in October and to be completed before the end of November. Exploration work will then focus on defining targets for drilling following the end of the wet season early in the New Year. 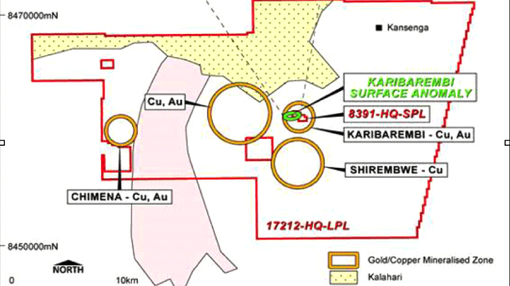 IRG plan to provide regular updates to the market as this maiden exploration program at Kalengwa progresses.